Rapper Feud Mirrors World Politics An article on ForeignPolicy.com compares the conflict between rappers Jay-Z and The Game to the U.S. relationship with states like Iran. Jay-Z is the dominant force in rap music, but could be hurt whether or not he responds to taunts from The Game. Some of the greatest minds in national security have turned their attention to a classic problem: When there is one dominant power, the rest of the world tries to challenge it. That's what happened to Britain in the 19th century and to the United States today. The same thing is happening in the world of rap. Jay-Z performs at The Pearl concert theater at the Palms Casino Resort July 3, 2009 in Las Vegas. "The way that rappers compete with each other — this is soft power," says Marc Lynch, author of a recent article for Foreign Policy.com comparing world politics to rap feuds. "This is the way you try and make a reputation, try and get what you want, and you have to do it through this very intricate series of alliances." He adds, "There's rules to follow and, when you break those rules, there's consequences." That's because groups of rappers will get together and gang up on other rappers. Lynch, professor at George Washington University and the director of the Institute of Middle East Studies, tells Steve Inskeep he has always been a rap fan and is interested in parallels between rap, political science and international reactions. The conflict in question is between established rapper Jay-Z and and up-and-comer known as The Game. Jay-Z has been attacking other rappers for using Auto-Tune software, which corrects pitch while singers record. 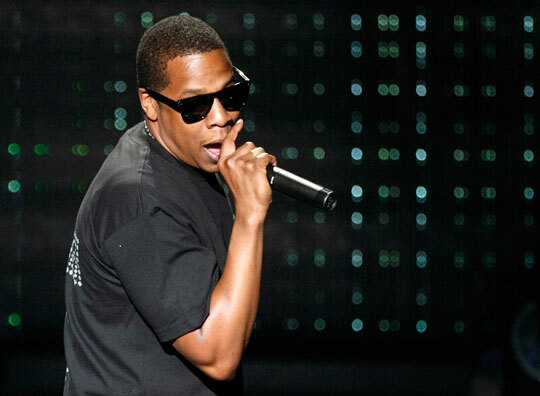 Auto-Tune is widely used in the industry, but Jay-Z is making a call for authenticity. "He's saying 'these are the rules of the international system. If you want to be a civilized member of our international society, you have to not pursue nuclear weapons,"' Lynch says. The Game is using the opportunity to tag Jay-Z as old and irrelevant. There's a history of this in the rap world: 50 Cent rose to power by destroying the career of Ja Rule. Jay-Z did that to a number of people while he was a rising power. "If you go back to, like, 19th century bounce-power politics, this is how rising powers would make it," Lynch says, citing conflicts between Japan and Russian as well as among rising powers in Europe. "If they wanted to get somewhere, they had to take someone out." The difference today is that we're in a uni-polar world with the United States on top. In the rap world, Jay-Z is that guy. The Game is the erratic wildcard. "He's North Korea; he's Iran," Lynch says. "He might not win, but he can hurt you if he drags you down into this extended occupation, this extended counterinsurgency campaign." Why is he doing this? After Jay-Z released "D.O.A. ('Death of Auto-Tune')" The Game saw an opportunity to peel off Jay-Z's key alliance partners to form a coalition and undermine Jay-Z's hegemony. Even if he loses the fight with Jay-Z, The Game's stock goes up because he's "in" with the big guy. All The Game has to do, Lynch says, is survive. Lynch says that, like the United States, a hegemon like Jay-Z can't afford to get into little battles all the time. "So Jay-Z, like the United States after the war in Iraq, has got a tough decision to make," he says. "Do you ignore these provocations? But then they might spread — then people might think that you're weak. Do you hit down really hard? You could maybe destroy The Game, but you're going to be exhausted in the process." It's like the United States having to fight counterinsurgency campaigns worldwide. The more powerful you are, Lynch says, the more limits there are on your ability to use that power.